Latest version : package file with modified date : 2/25/2018 05:5x AM. Please make sure you have the latest version. Fix problem so that on the day of prom, after-school activity event should not be executed. Previously, on the prom day, there is still a chance that after-school activity is triggered that makes the sim will still out until 10PM, but after-school activity event run instead of prom. Fix problem when saving and quitting game while sim is in school on prom day and has picked a friend as prom partner, and then load the game again, the partner is become random reference like "NPC controller" or something random. Fix problem that the prom sim gets a day off work on the day of notification (a day before prom day). Fix problem that sometimes for "no homework today" notification appear as "bus no longer coming for sim due to own car". Please note, this is just notification text problem, so the school bus will still come as usual and your sim is not assigned to any car as it should be. Randomly on Monday, Tuesday, Wednesday or Thursday, your teen sims will get notification and the day after they will have prom. That day, your sim will be in school until 10 PM. Random prom event will happen, your sims will go home and get prom memory. Teen sim will randomly got notification when they come back from school that tomorrow there will be prom hold in their school. The older the teen sim, the bigger the chances. Prom only happened Tuesday, Wednesday, Thursday, or Friday. Due to this mod works at-school interaction, so all the event will run only when sims go to school (thats why prom only happens from tuesday-friday, monday-thursday for notification). In snow day, if you want a chance of this event to occur, you have to your sim to school by walking or driving. Sims that will grow up on Monday, will get prom on Friday (notification on Thursday) before grow up. Sims that has at least three days more to grow up will always get prom notification. 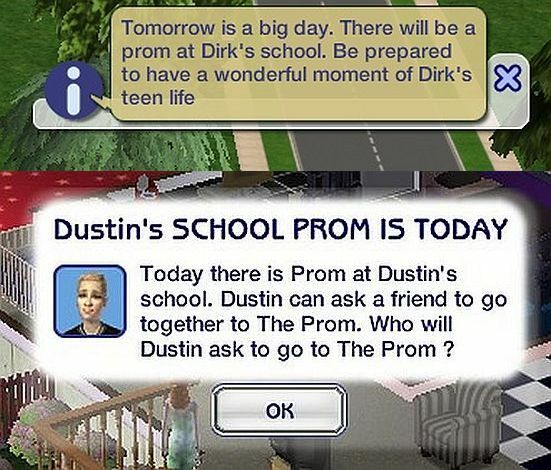 Prom is only happened once in active sims' life time. 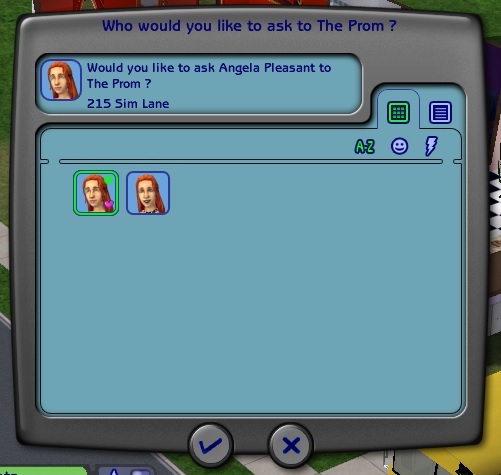 Before prom, A sim can choose which other non-family teen sim that he/she ask to attend prom with him/her regardless the relationship as long as not enemy, or choose to go to the prom alone. If there is no eligible friend to be picked as prom partner, sim will automatically go to prom as single person. A sim cannot choose a teen sim from his/her apartment neighbor. This is due to the game will give wrong neighbor ID when the chosen sim is neighbor from the active apartment lot. On Prom day, a sim will be home from school at 10 PM and will come home with his/her formal outfit. On Prom day, neighbor teen sim in active sims' apartment will also be home from school at 10 PM and wear formal outfit, but has no memory about the Prom. On Prom day, a sim that has part-time work will be given a day off if the sim goes to school, thus his/her job performance will not drop for missing the work due to Prom. There will be prize and will get memory based on event that randomly happened on prom. The memory will be given to active sims and the sim that they choose (if any). Although a sim that the active sim chooses as partner will get prom memory, but when that sim is played, if he/she still can get prom event. 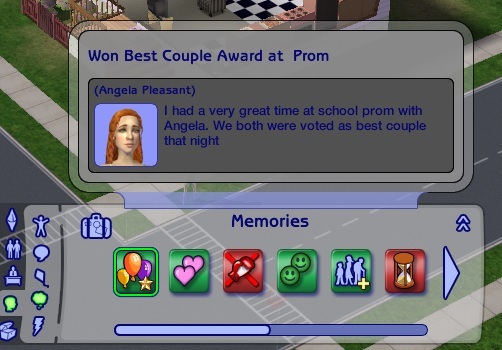 Thus she/she can get multiple prom memories but only one memory from his/her active game play, since prom is unique per active teen sim. If there are two or more teens at the same time at the active household, there will be a big chances of different time of prom, because prom event can be occured at different times in a sim's teen life, in spite of unique per active teen sim. 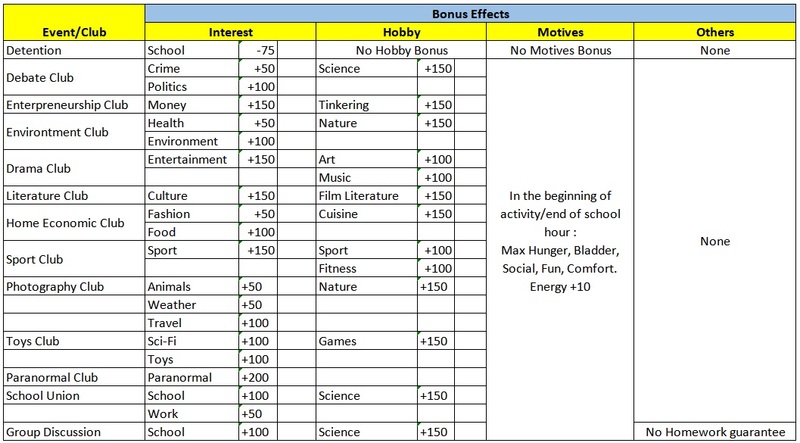 Most of the sims's motives except energy (and environment) will be maxed after prom. But be careful, it is like your sim will be exhausted. They were just in school for 13 hours non stop!! No homework guarantee for the prom sims. Can be triggered by both child sim and teen sim when they attend school. There is slight chance for your child or teen sims to do activity after school in the background. 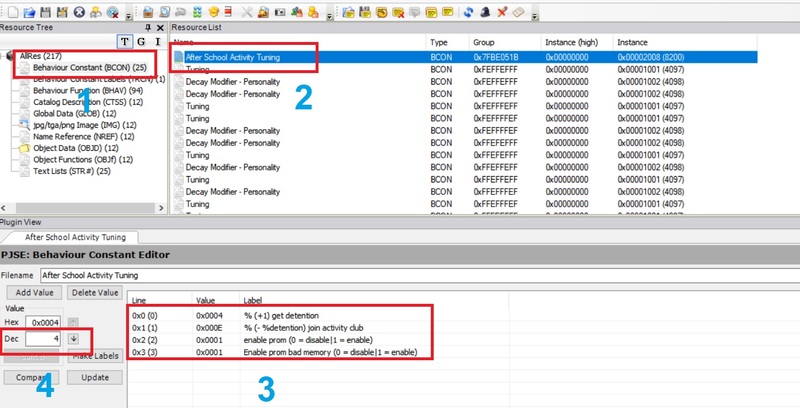 Two kind of event category : detention and after school activities. For after school activities, there are 12 sub-events that will be randomly picked, that details you can see in picture number 5. During the event, the sim will be stay in school for extra 2 hours. This is not configurable (except change the code), since there is possibility for teen sim to do part-time work after school. If an event is occured and teen sims has part time job (usually at 3PM, in which the event also end at 3PM), the sim has to go to work right after he/she arrives at home, using carpool or walk to work. Unlike Prom, there will still be job performance penalty for missing work due to after school activity. - Twojeffs' school bus/bring friend & homework hack (Reported by Fearless Butterfly, conflict with STR# that can caused blank popup/notification). You can try to ressolve this conflict this these steps. It is for bring friend from work by MQ, but it is similar with twojeff's bring friend except you do not have to change the BHAV part since school realated dialog string is not updated by EA-Maxis since Seasons. I also create some new instance under group 0x7FBE051B : 0x2055 (BHAV), 0x2059 (BHAV), 0x2060 (BHAV), 0x2061 (BHAV), 0x2062 (BHAV), 0x2063 (BHAV), 0x2064 (BHAV), 0x2008 (BCON). Version number 3 for inteen compatible. For you guys who has inteen installed in your game, please download this file, otherwise, my original mod will be overriden by inTeen, thus won't work at all . I only make 1 flavour for inteen based on most downloaded flavour, but you can customize the setting as your desire. The step is in the following. Do not change the package name since it is needed so that my mod will be loaded after inTeen. Want to set your own flavours other than above ? Do not worry, just open your package using SimPE. Open resources as shown in picture number 6, and change the value, commit and save. Note : sorry for confusing tutorial. It is coding-related stuff. 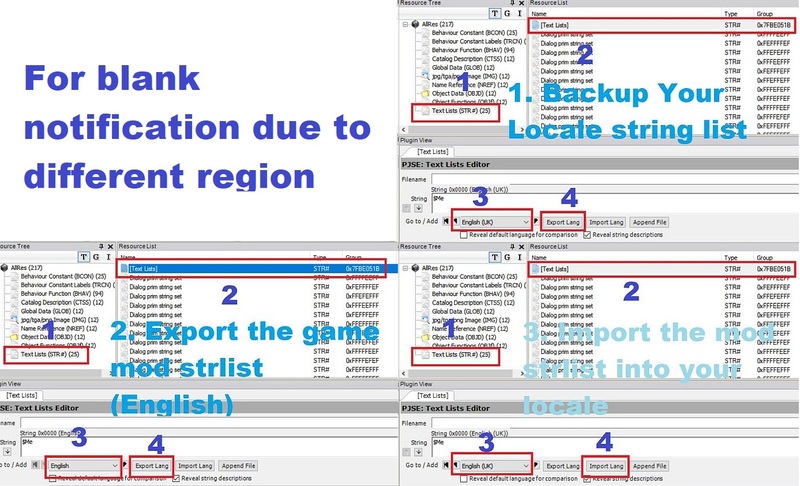 - You can also disable Prom or disable prom bad memory with change the value of "enable prom (0 = disable|1 = enable)" or "Enable prom bad memory (0 = disable|1 = enable)"
Just put my mod in Downloads folder of your sims 2 data. If this mod does not work, try to change the load order, like rename my mod to "z_pqw_afterschoolactivity.package". 161 people have said thanks to piqiwi for this download.